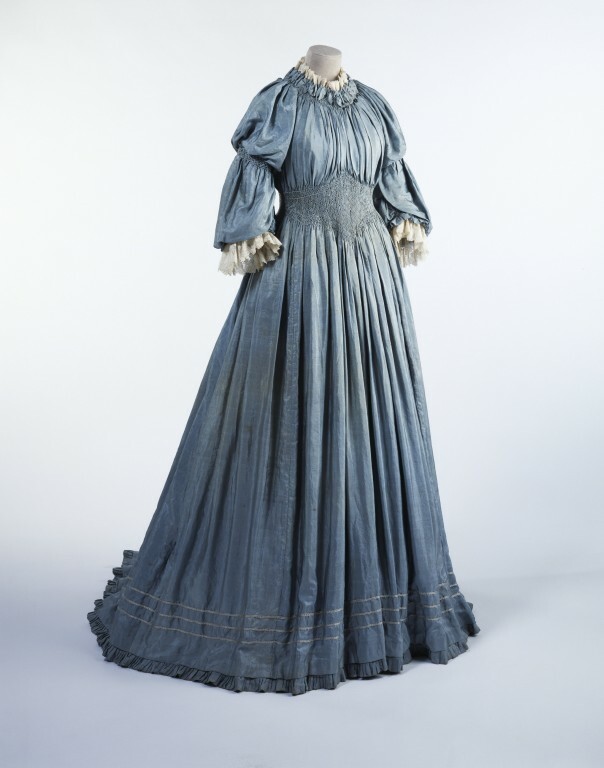 This dress has many of the features associated with the dress reform trend of the late 19th century. The trend ran parallel with the Arts and Crafts Movement and advocated a radically new approach to dress in an effort to free women from corsetry. The clothes were homemade or produced in commercial studios. They used natural and artistic materials and often included hand-embroidered decoration inspired by the countryside and wild or garden flowers. Smocking too, seen here at the waist, on the sleeves and at the neckline, evoked an imaginary rural simplicity. It sometimes featured on dresses designed and sold by the London firm of Liberty & Co, who sold gowns in the Arts and Crafts style. Dress of blue pongee silk trimmed with smocking and machine-made lace. Full length with train, medium height round neck, double-puff elbow length sleeves, trimmed with smocking and frilled edge. Fastens at the back with brass hooks and silk eyes. The bodice is lined with silk twill and well boned. Corded silk waist-band fastening with a double pronged buckle. Skirt is lined with cotton. The dress is cut to fall in soft folds from the neck to the hem and is held at the waist with a diamond-shaped band of smocking. Hem is trimmed with three rows of pale blue silk embroidery and has a frilled border. At the waist there are small silk covered and embroidered buttons with worked silk loops. Purchased. Registered File number 1984/2252. Metropolitan Musem of Art, New York: Costume Institute Acc No 68.539: Teagown, pale pink silk barathea and white China silk, given by Mrs Carnegie by her husband, 1891. Dress of blue pongee silk trimmed with smocking and machine-made lace, designed at Liberty & Co. Ltd., England, ca. 1895. Liberty Catalogue (no.25), 'Evolution in Costume illustrated by Past Fashion Plates and Present Adaptions of the EMPIRE AND THE EARLY VICTORIAN PERIOD', Compiled and invented by Messrs LIBERTY LONDON& PARIS 1893. Karen Livingstone and Linda Parry, eds., International Arts & Crafts (V&A: V&A Publications, 2005), p.224. Britain; made by Liberty & Co.